Traditional Pool by Fort Wayne Furniture & Accessories CDI: Choice Designs, Inc.
Bohemian style isn’t just a design concept; it’s a way of life. If you’re considering new pool landscaping and love the hippie influence (or perhaps lived through the era), follow a few simple steps and your backyard will take on new life. The funkier and more eclectic, the better. 1. Rethink patio furniture. Boho design calls for mismatched pieces that look as if they were meant to be part of one unit. Shop antique stores or vintage markets for different chairs and intricately designed throw pillows. Your goal is to appeal to the sense of touch just as much as sight--a cozy hammock would work better than hard metal chairs. Fill the patio floor space with rugs or blankets so guests can find a seat at a moment’s notice. 2. Incorporate Mother Nature. This might seem like a given for any pool landscaping project, but try and think beyond a flower bed or blanket of succulents. Start an herb garden along the patio’s perimeter or repurpose old crates and mason jars to serve as vases for the latest farmer’s market finds. Turn an old Ikea shelving unit into plant cubbies for a well-organized urban garden. 3. Get crafty! The very essence of bohemian culture is to make do with what you have—to value art and creativity over material goods. As such, raid your closets and see what might inspire your next project. Pinterest is full of DIY instruct-ables from dream catchers to seat cushions and candles. If you prefer to skip the labor while still opting for the shabby chic look, seek out local artisans for upcycled tables and one-of-a-kind artwork. Mediterranean Pool by San Jose General Contractors Black Bear Builders, Inc.
4. Play up pool features. 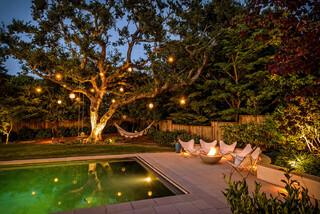 Line the pool deck with metal lanterns or illuminate the water with floating candles mixed with real flowers. Rather than leaving a stack of white towels for your guests, invest in several bright kimonos or throws for post swim-time lounge wear. Create a mobile bar for use near the tanning ledge so your next cocktail is always within arm’s reach. 5. Appeal to all senses—especially smell. Aromatherapy candles will set the tone for any bohemian patio. Light incense or place a few essential oil diffusers on the end tables to enjoy as you relax after a long day. If you regularly enjoy eating or entertaining on the patio, place a fresh single flower inside several mason jars for added brightness and aesthetic appeal. Wrap your homegrown sage and burn it to keep bugs away or start the backyard fire. It’s also known for its mystical ability to clear negative energy. Boho pool landscaping concepts don’t need to be costly or elaborate—that's its allure. With a focus on natural, Earth-inspired décor rather than cookie-cutter furniture and centerpieces, you and your guests will feel instantly peaceful and welcome. Store a few old yoga mats in the corner for later use. Create a beaded curtain for the perfect entrance to your backyard oasis. Creativity is king, so make it personal and fun! There are no rules for the bohemian way of life.